While nothing beats the smell, look and feel of new carpeting, this can unfortunately be short-lived. That’s why regular carpet maintenance is so important. Carpets catch a lot of dirt, dust and other contaminants, no matter how careful you are. Skimp on maintenance, and your carpets can quickly make a room look dingy or even turn it into a health hazard. Thankfully, keeping your carpet clean and smelling good isn’t as hard as you might think. You just need to give it some regular TLC. While your carpet is still bound to get dirty, no matter how often you use it, taking some preventive measures can greatly minimize wear and tear. Shoes, for instance, pick up dust and other dirt particles from outdoors. When you step onto your carpet, these are ground into the fibers and can eventually cause irreversible damage that leaves your carpet looking dull and lifeless. You should always wipe your feet thoroughly before you step on carpeted areas, as this will minimize the amount of particles that come in contact with your carpet. Or, even better, why not go for a shoes-off policy? No matter how thoroughly you wipe your feet, or even if you have a shoes-off policy, your carpeting is still going to trap some dust and other particles. The truth is, your carpet is a lot like a giant filter, and it will catch dust from anywhere – an open window, your air conditioning system, or even dead skin cells. These accumulate at surprising speed and, besides making your room look unsightly, can quickly turn your carpet into a magnet for allergies and other bothersome ailments. That’s where vacuuming comes in. 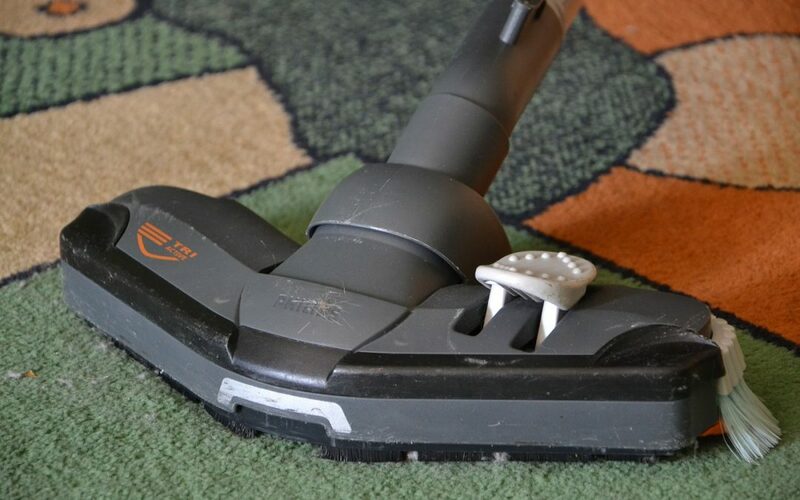 You should vacuum your carpet at least once weekly, or even more. In fact, in highly trafficked areas such as your foyer or living room, you should aim to vacuum your carpet at least every other day. This will ensure your carpet stays looking and feeling fresh and dust free for longer – great for your health, your home, and also your pocket. Despite your best intentions accidents can happen. Perhaps your kids went crazy with their crayons on the carpet, or you’ve tripped on a misplaced chair, spilling spaghetti and meatballs everywhere. The trick, when dealing with accidents and spills, is to treat them as quickly as possible. The longer you wait, the more time they have to bind with the carpet fibers and the harder they become to remove. If you’re feeling a bit more adventurous, you might be tempted to give your carpet a deeper clean yourself. But while on paper this might sound like a good idea, it rarely works out that way. Store-bought products and equipment are available to the general public, so they’re not as powerful or effective as professional-grade equipment. You’ll also need the know-how to mix detergents in the right doses and to use the equipment correctly. Otherwise you risk flooding your carpet, damaging it or causing stains to bind to the fibers, making them impossible to remove. That doesn’t sound at all like a great time, does it? Ideally, you should stick to vacuuming and, if at all necessary, to using natural products such as salt or baking soda to remove stains. You should have your carpets professionally cleaned at least once every twelve months, as this will ensure they remain in optimum condition. Professional carpet cleaning companies have industrial grade equipment which reaches deep into your carpet’s fibers and backing and removes dirt and other contaminants that would otherwise be impossible to reach. They’ll also re-coat your carpet with protectant, which keeps up its resistance to stains, soiling and other wear and tear. This not only helps your carpet stay cleaner and extends its lifetime considerably, but also greatly reduces the amount of allergens and other contaminants you’re exposed to. Most carpet companies require you to professionally clean your carpet every twelve to eighteen months, or risk voiding your warranty. Unless you want to chance being saddled with an unnecessary expense, regular professional carpet cleaning is the smart way to go. Need help keeping your new carpets in tip top condition? Click here for a free quote.